Sausage and Herb Stuffing. 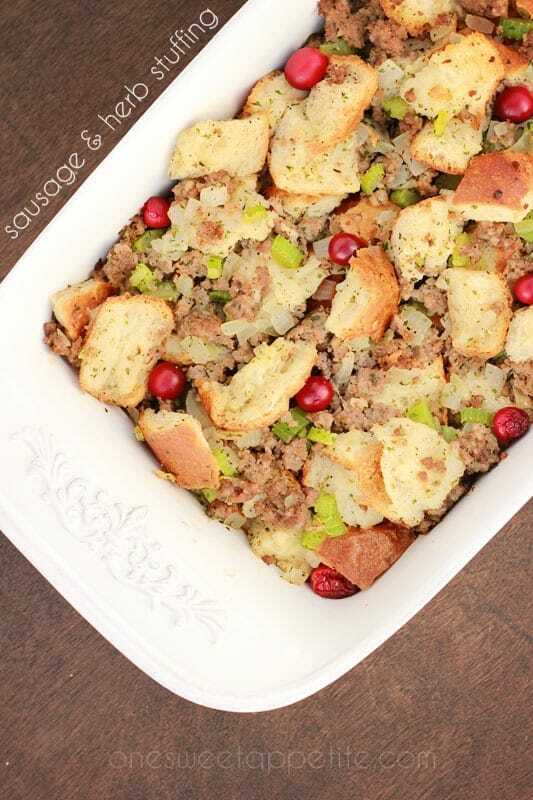 This modern twist on a classic Thanksgiving side dish adds a bold pop of flavor with sausage and cranberries! I grew up with homemade stuffing. My husband grew up with boxed. 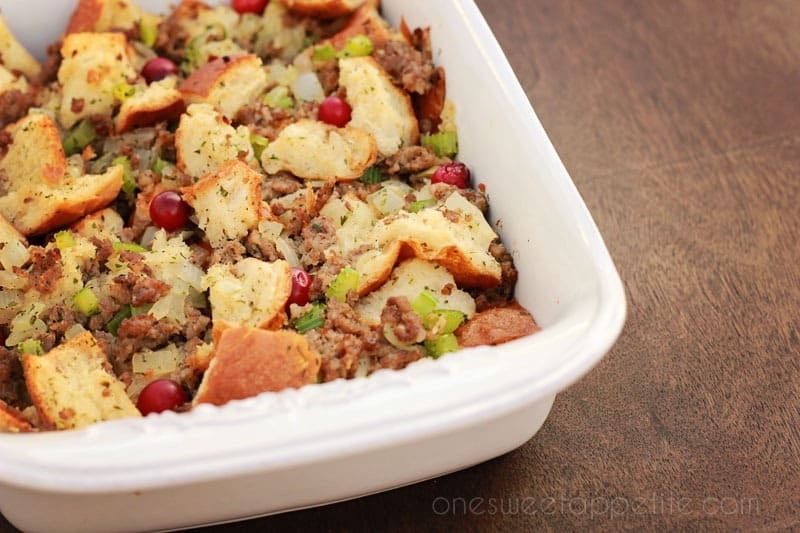 Over the years I have attempted to please both parties, but it is rough finding a stuffing recipe that really wows us both. 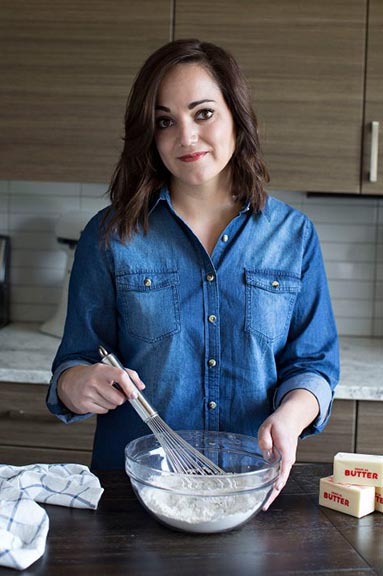 This recipe… It has everything. What surprised me the most was the flavor combination of cranberries and sausage. It is the side dish I have been missing all of my life and did not even realize it. The sausage adds a tasty spice element while the cranberries bring in a little tart. Combine those with your classic ingredients like bread, chicken stock, onions, and celery and you have got the ultimate stuffing. It might even outshine the turkey! Ok, probably not. But it is high up there! We like to use spicy breakfast sausage. It adds just a bit of a kick and really takes things up a notch. NOTE: You will need to double the recipe for a 9×13 pan. Which might be a good idea. You will be amazed at how quickly this will disappear from the table! Like this recipe? You will love my Slow Cooker Stuffing, Simple Turkey Gravy, and Perfect Mashed Potatoes! Preheat your oven to 425 degrees. Spread your cubed bread onto two baking trays and toast 8 minutes, or until just lightly browned. Lower the oven temp to 350 and place the bread into a large bowl. Set aside. Combine the butter, onion, celery, parsley, salt, and pepper in a medium pan. Cook until the onion is translucent and the celery is soft. Pour over your bread. In that same pan cook your sausage until crumbled and browned. Stir this along with your chicken stock and cranberries into your bread mixture. Place into a 9 inch square pan and bake for 30 minutes. I love stuffing, it’s one of my favorite sides for Thanksgiving! This looks so delicious, I wanna try it! This looks amazing! I can’t wait to have stuffing this year. Pinned! 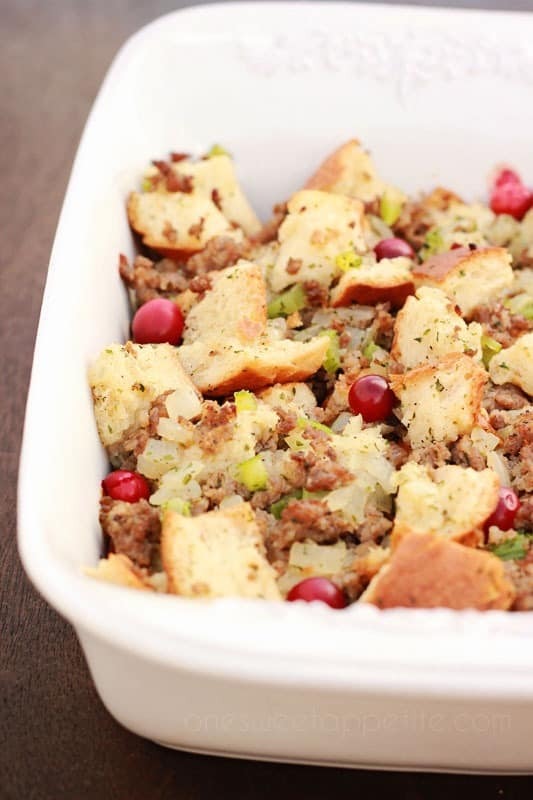 I LOVE cranberries in stuffing, so this really looks so good! Plus, I love all of the color. Such a nice contrast to so many stuffings that are so monotone! I’m always looking for better stuffing recipes. You’re sounds just perfect! We missed you at the big meal but hope you are doing well!